"Bad Moon Rising"/"Trouble By The Waddle"
Kevin, Krypto & Streaky are soaring through the night sky, its bright shining Harvest Moon glowing as they head home. What the trio don't see is Mechanikat's satellite hiding in orbit behind the moon. At S.T.A.R Labs bell rings at the communications lab, an elderly professor investigates to find a little brown kitten purring at the door. He brings the kitten inside and sets it down to rest for the night as he leaves. As he does so the kitten wakes up and kits itself out in a headband and katana blade. It takes out the security system with a swipe and uses knockout gas on the remaining scientists. Using the lab equipment Ninja inputs commands to set Mechanikat's evel plan into action and heads back to Mechanikat's satellite. Ninja smiles with glee unmasking himself as henchman Snooky Wookums! Krypto and Streaky have long since arrived home and peacefully drifting off to sleep... until they notice the Harvest Moon is swaying in hypnotic motions... Using his telescopic vision Krypto discovers all the cats in Metropolis have been entranced, even Streaky!! What's worse is that the whole city has been ransacked! 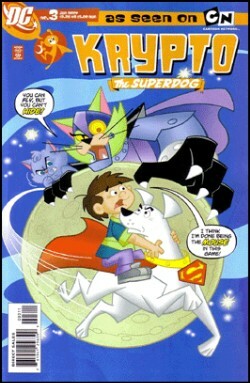 Krypto rounds up all the cats and returns the loot at superspeed. But is shocked to discover the police can't make any arrests or keep the peace as they have been sent to sleep! Taking to the skies Krypto decides to investigate the swaying moon. Instead he discovers that two S.T.A.R satellites have been doing the swaying in deep space, reflecting the moons glow down on earth. Before he can dismantle it Streaky arrives and they begin a catfight. While the two friends fight Mechanikat lands on Earth intent on collecting the booty and selling it across the galaxy. Krypto rips up one of the satellites and raps it around his friend. The disruption of the light beam reawakens Streaky and the to pals head to Metropolis. Using the second satellite they unhypnotise all of the cats from their thievery mission and onto a 'cat-bonding' mission to board and stay with Mechanikat. Overrun by cats Mechanikat and Snooky are trapped! Laughing Krypto and Streaky promise to set things right... after they've had their long overdue nap! Ace is in Metropolis. His secret mission set by Batman is that Penguin leaves America to London. Oswald does so and takes his Wingmen, the less than intelligent Artie, the puffin, Griff, the vulture & Waddles, the penguin with him. As the plane flies over the North Pole, the Wingmen are getting grumpy, trapped in a confined space. The three get into a fight and accidentally knock Waddles out the planes cargo exit. One thing... PENGUIN'S CAN'T FLY!!! Crashing deep into the snow and ice Waddles finds himself in a giant fortress of ice and crystal. Following the noises of gadgetry Waddles is shaken to discover he's in Superman's home, so much so he accidentally activates a console. Superman's Kryptonite testing tube, which of course traps Superman inside. Superman begs Waddles to active the release button before the Kryptonite overwhelms him. Nervously he activates a brain booster instead. Superman is able to send a distress signal to Krypto in his own backyard fortress, where Krypto and Ace are chilling out. Rushing to the rescue on a jet powered Bat-Sled the world's finest pets arrive to meet Waddles and his giant Mind Gorilla powered by his super brain. The Gorilla smashes them into the ice and into some rope restraints before vanishing. With his last ounce of strength Krypto smashed Ace's collar with his head, the force of the blow sends out a Batarang which smashes Superman's crystal prison! Promptly Superman rescues his two friends and arms them with a mind retractor beam. Krypto and Ace rush to a nearby Eskimo village to find a Mind Tyrannosaurus Rex attacking the poor people. Launching the Retractor they sap Waddles of his super intellect and with it the Mind monsters. A clumsy penguin again Waddles regrets he hadn't tried to use his power for good instead of plotting revenge, just as Krypto and Ace ship him to London to be with his owner! Story - 4: A breath of fresh air in comics. A big whopping pile of sillyness with oodles of family fun thrown in. I like having two short stories per issue! A nice safe read harking back to DC's silver age. Art - 4: Athough the art isn't quite what the original line of DC animated books was. I suspect this is more due to the shows character models (Shaggy & Scooby: Get A Clue anyone?) I find it slick and nicely illustrated! Very Cel like in many places!